The move has prompted some concern in the area, as a €75 million redevelopment takes place. THE WALKWAY ALONG the side of the old Central Bank building in Dublin’s Temple Bar is to be closed for at least a year and a half, prompting concern from some residents of the area and a complaint over lack of notice from a city councillor. There’s support for the move from elsewhere in the capital’s nightlife and cultural district, however. The CEO of the Temple Bar Company, which represents businesses and cultural centres, said the eventual prize – the redevelopment of the landmark building – would be “worth the wait”. 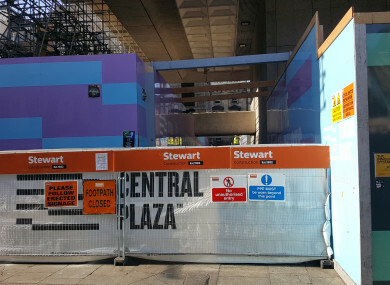 The walkway from Crown Alley to Dame Street, regularly used by shoppers, commuters and tourists, was closed last Saturday as construction work at the complex steps up a gear. Plans for a €75 million redevelopment at the iconic building, including a new 360-degree 300-seater rooftop restaurant and bar, were given the green light last month. The building’s joint owners, Hines and the Peterson Group, are overseeing the ambitious plan which will also see the office space in the building be revamped to house 1,300 workers. “The walkway between the former Central Bank Tower and the adjacent Annex building will be closed for the duration of the project to facilitate the development works on the plaza,” a spokesperson for the developers of the new Central Plaza said. “For health and safety reasons this thoroughfare could not remain in operation as it is now in the middle of a live construction site. The statement pointed out that alternative pedestrian access was available nearby and that this access was now clearly signposted at the location. Frank McDonald, chair of the Temple Bar Residents Association and a former Environment Editor at the Irish Times, said he had been taken by surprise by the closure and that it would not have been impossible to keep the route open. “The pedestrian route between Dame St and Crown Alley goes back centuries,” he said in an email. “Even when the Commercial Buildings stood on Dame St, there was a route through its courtyard, and that’s why it was provided for when the Central Bank was developed in the late 1970s. While I agree that it’s problematic to maintain, in the context of current building works, it would not be impossible to do so. Convenience for the contractors plus ‘health & safety’ considerations have won out. Independent councillor Mannix Flynn insisted a right-of-way existed at the location, and that the developers had not given proper advance notice of the closure. He said he had asked Dublin City Council to explain how the decision was made and that he was concerned it would set a precedent for developments in other areas. “I don’t intend to let this go,” Flynn said. Martin Harte, the chief executive of the Temple Bar Company, said he didn’t think the closure would have too much of an effect. Most of the tourist footfall in Temple Bar comes “from the bottom up,” he said – adding that the walkway was mainly used by commuters on their way to and from work. The fact that construction had finally started at the complex was to be welcomed, he said. It’s understood the developers obtained a hoarding licence from Dublin City Council, in line with the stipulations of planning permission. The works are expected to take 18 months. Email “Pedestrian walkway along old Central Bank site to be closed until 2020 ”. Feedback on “Pedestrian walkway along old Central Bank site to be closed until 2020 ”.